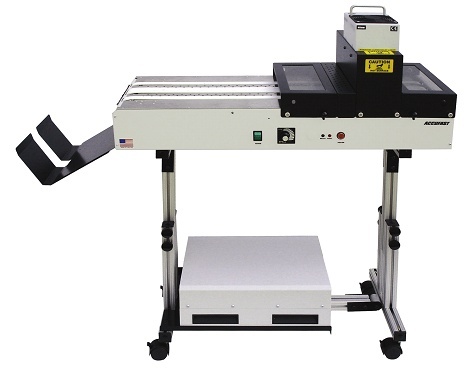 The 3X13VT - UV combines a compact UV Curing unit and the popular ACCUFAST 3x13VT conveyor. By mounting the Curing unit over the conveyor, ACCUFAST has created a simple, powerful curing module for many applications. 3 Inch Curing Swath expandable to 6 inches be adding another curing unit. Automatic piece detection allows the curing unit to stand by on low power until needed. Variable speed conveyor allows for slowing the belts to increase curing time. Vacuum table. Simple transport with no rollers until ink has cured. Interlocked input and exit covers contain UV light, but allow quick access to paper path. Adjustable height legs allow curing at the output of a variety of print modules.